As I mentioned on Tuesday, if the SPX managed to break 1685ish, the count wouldn't look that great anymore. The break hasn't been that convincing but still I think it's time to look at other possibilities. 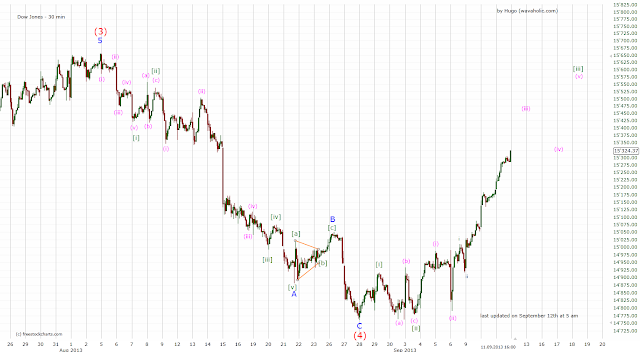 Below is an alternative count (shown for the Dow Jones). It's very possible that wave (4) is already over. If so, wave (5) is underway now. In this bull market fifth waves tend to be very short. Thus, I don't expect it to be as long as wave (1) or (3). Looking at the previous waves in this bull market wave (5) being 0.5 to 0.62 of wave (1) seems reasonable. These figures lead to a target for wave (5) of 16200 to 16600. The count is void if we decline below the August lows and highly unlikely if we drop below 14950ish.